This Caramelized Red Onion Tart will easily become a favorite stand-by recipe. It is the one you can call on when you want to cook something quick, tasty and with a wow factor. The tart is incredibly versatile – serve it as individual tarts, or make a large one. It is delicious warm or cold and makes a great lunch box, picnic or buffet treat. You can dress the recipe up or down (see the variations below). The onion tart is also a great dish for vegetarians, perfect served as a starter or with a salad or seasonal vegetables makes a great main course as well. Grease 4 x 4 1/2 inch individual tart dishes with butter. Slice the onions very thinly. Melt the butter in a large frying pan and cook the onions for about 10 minutes until very soft, take care not to brown the onions. Add the wine, vinegar, and thyme and cook until all the liquid has evaporated. Season. Divide into four and leave to cool. Divide the pastry into three, sprinkle each piece with finely chopped walnuts, then place each piece, one on top of the other and roll to 1/4 inch thick. Cut four discs of pastry to the size of the tart dishes. Cover the base of the dishes with a quarter of the cooked onions. with the onion mixture. Place a disc of pastry over the onion mixture and tuck the edges in. Prick all over with a fork, this helps in allowing the steam to escape during cooking and therefore keeps the pastry crisp. Bake in the preheated oven for 15 minutes or until golden and risen. Place a large plate over the tart dish, invert and shake firmly to release the tart, repeat with the remaining tarts. Serve warm with the figs, a baby leaf salad and drizzle with a little walnut oil. 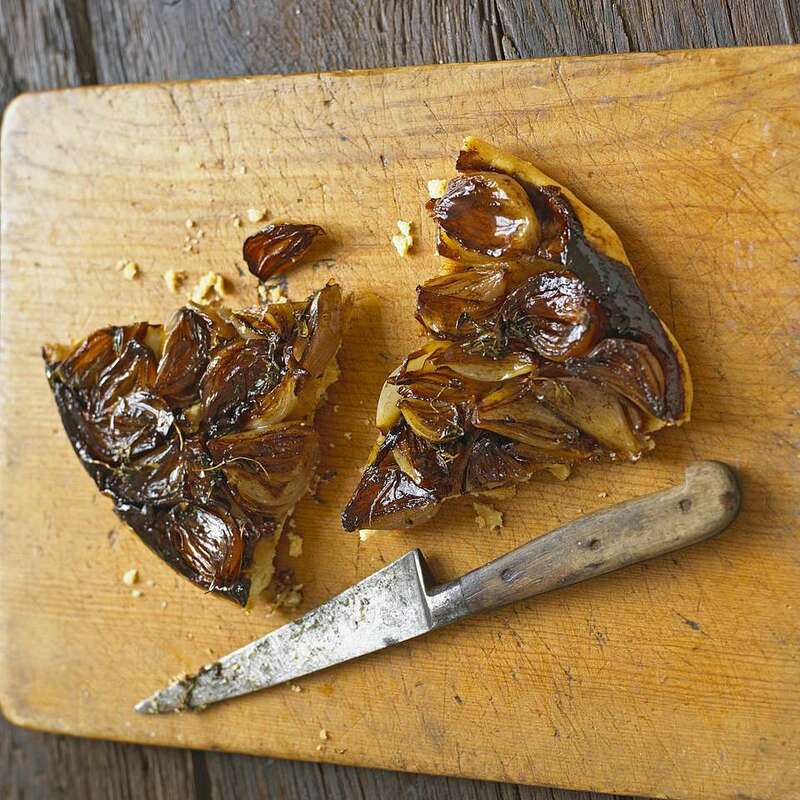 Caramelized Onion and Goats’ Cheese: Place crumbled goats’ cheese on the base of the tart, then cover with the cooked onions and proceed with the recipe. Tomato and Onion: Lay thin slices of fresh tomato on the base of the tart then cover with a layer of cooked onions and proceed with the recipe.